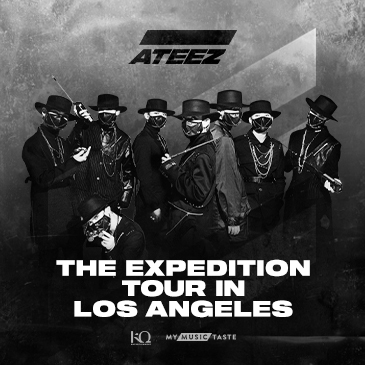 South Korea’s rising boy band ATEEZ is coming to Los Angeles to meet their fans through their ATEEZ - The Expedition Tour in Los Angeles on March 15 in the Globe Theatre . KQ entertainment’s rising 8-members group is already set as one of the main representatives of the new K-pop generation with their well-crafted performances and producing skills. This will mark ATEEZ first tour in the USA, made as a result of the overwhelming demand of their fans on MyMusicTaste, a global online service that allows fans to request their favorite artists to their city. If you have requested ATEEZ on MyMusicTaste, your unique, one-time use promo code have been sent to your MMT-registered email and phone number. Enter your promo code at checkout to redeem your presale and 10% discount benefit! The line will be first, based on the number generated on the said website, then attendees who didn’t get to generate a queuing number will be placed on a first come first served based. *If you are not a MyMusicTaste member yet, join us on https://mmt.fans/aVxL/ and request your favorite artist's concert! You too can have access to special perks when your dream concert becomes a reality! MyMusicTaste is a fan initiated live event making service that brings fans, artists and promoters from all over the world together in one place to create a valuable and meaningful concert experience for everyone involved. MyMusicTaste puts the power in the fans' hands, allowing fans to request their favorite artist's concert in their city. With the mission to connect and amplify the voices of fans all over the world, MyMusicTaste successfully promoted concerts of artists such as GOT7, MONSTA X, Kehlani, and many more in over 52 different cities. With the simple idea--empowering fans to bring their favorite artist’s concert in the city of their choice based on fan demand--MyMusicTaste is challenging the $27 billion concert market through cutting-edge technology and sophisticated, user-friendly service. Currently, www.mymusictaste.com supports more than 30 countries and offers 15 different languages.